Anne and Jochen discussing the design of her new saddle. 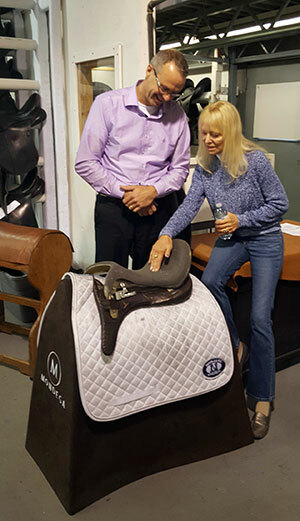 This past week Schleese Saddlery along with Saddlefit 4 Life had the pleasure and honor of hosting well-known Olympic 5* Dressage Judge, US team member and former US dressage coach Anne Gribbons at our facility in Holland Landing. Anne is going to be working with Schleese to design a new dressage saddle and totally believes in the concept of Saddlefit 4 Life of finding the correct saddle fit for horse and rider – regardless of breed, size, and body type. Anne took the opportunity at lunch to speak with the entire staff of Schleese and gave us some insights into the profession of being a judge and trainer. She was a charming and engaging presenter, and everyone appreciated the time she took to come and visit the production facility personally. She told us that when she was younger she used to ride between 12 and 15 horses a day and had never much thought about the fact that she was using the same saddle for every horse. “A saddle is a saddle is a saddle” was the philosophy of the time. But now that she works closely with elite athletes in the US she realizes how times have changed and how it’s now ALL about the saddle as part of the whole package. She has read Jochen’s book “Suffering in Silence” which also made her realize how much she didn’t know that she didn’t know…and having toured our facility and spoken with our craftsmen she admitted she still had much to learn! (Anne is one of the most humble and self-effacing people we have ever had the pleasure to spend time with). When training other riders, she heard how very opinionated people are about saddles – without necessarily understanding ‘why’ they ‘just like it’. Professional trainers have to ride in pretty much every saddle and learn to adapt because the horses they train usually come with their own saddles. What she likes about Schleese is the fact that we not only make the saddle for the horse, but also adapt it to the rider – which is the way of the future in this industry. What is it like being an Olympic Judge? “There are only about 30 dressage 5* judges worldwide as ordained by the FEI in Lausanne Switzerland. These have all paid their dues and worked their way up in the ranks. There are three in USA and two in Canada (Libby McMullen and Cara Whitham). It’s an extremely high pressure job, especially in the last years as things get more high tech and much more expensive (including horses and saddles!). The judges are pressured not only by the trainers and the competitors, but also by the media – and it is a difficult job to do to everyone’s satisfaction. She made it clear that when your horse has an off day, it can ruin your whole day. But when everything falls into place during your ride – it’s a wonderful day! 30/40 years ago a score of 60% in a test was considered amazing. Now it has to be 80% – what happened? “Basically two things happened: It used to be very tough to get a good score when dressage was relatively new on this continent; we were thrilled to score 60% in an FEI Test! As time went on, the scores started to escalate because we have better horses and better training nowadays. Horses are being bred specifically for a purpose – they are more athletic, more sensitive, and simply perform better. Riders are better educated and more experienced, and there are more good instructors now available in North America. Anne having a discussion with Schleese staff. Is it harder to be a judge now compared to – 20 years ago? What is the situation with hyperflexion? “It’s not been a real issue in training or warm up rings in America that I have seen. I have never had to complain to my riders about horses being ridden excessively long in this position to warm up as a schooling exercise. Sometimes you have a horse that borders between genius and crazy who absolutely benefits from a few moments of hyperflexion – but the media has at times captured this one minute and blown it out of proportion and out of context. And the supervision at all shows is becoming very strict to protect the welfare of the horse. Unfortunate is when this becomes a ‘normal’ training method and is used on all horses – it can make a young horse unhappy and despondent. Let me tell you that judges are very aware of this and it is discussed at every FEI judges’ forum. We need to educate riders about how hyperflexion can basically ruin the topline and the spirit of the horse. What is your greatest achievement – your passion? “My passion is the process and satisfaction of training a young,”raw,” horse up to Grand Prix. That is the greatest satisfaction of all! And my second favorite thing is to see a rider develop from basics into a good Grand Prix competitor. A good day is having a good training session. I was also so thrilled when I coached the US team riders and when everything worked, as at the 2010 WEG and the Pan Ams in Mexico where the US won every medal. Thank you Anne. We look forward to what the future brings!